Dutch – Dirty wet dog , boats and sailing. Talking about the galley and improvising a dutch oven for baking on the boat. 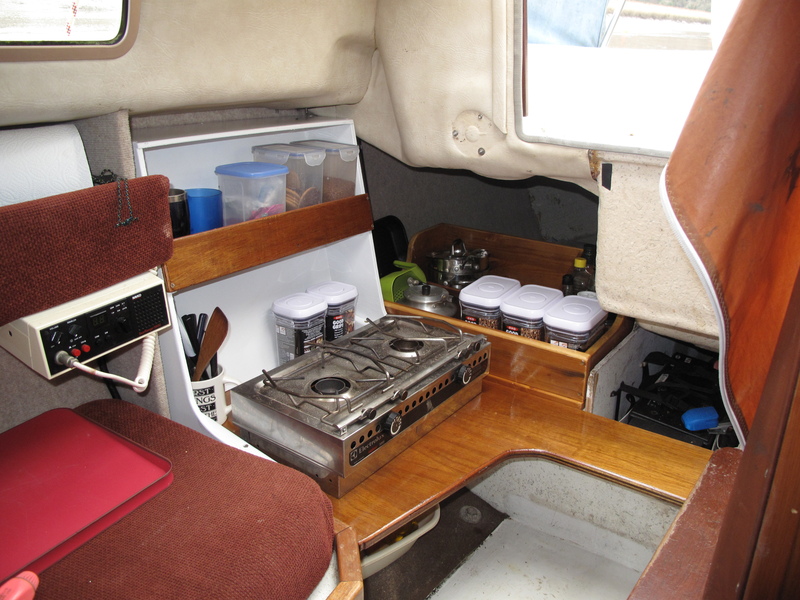 When i bought the Liberty the galley was in a really awkward place over the aft end of the port berth up against the heads bulkhead, the worktop and therefore the cooker was high enough to make the cooking position difficult so it became my first interior project. I did what many Liberty owners do and moved mine to the space just inside the companionway at the head of the quarter berth which i was never going to use. This space on the Liberty is just that bit smaller than the very good quarter berths on the Frances, its a difficult berth to get into so it now gets used for stowage and i made the combination worktop/step and started using that space to cook in instead. The galley is very simple and came together very quickly, its all built out of scrap materials and the paint and varnish that i had kicking around. The galley box that sits in the berth does obstruct access to the locker underneath it and does make it more difficult to get at stuff stored in the berth but i tend to keep stuff that i don’t need to access in there like reserve water and long life milk so its not really a problem. The galley now is much easier to work in as i can sit at the end of the berth with the stove next to me low down, that seems safer somehow and any spills would just go into the space inside the companionway and not over a berth or the cook. It does lack working space so i tend to do a lot of the food prep on the red tray, its a bit like cooking in a tent rather than a kitchen or a proper boat galley and so its a lot harder to cook when sailing : just about all i do when sailing is to boil a kettle which i can do from the cockpit although on the long cross-channel passage i hove-to and made a proper meal. Thinking back to each of my previous boats i have always ended up modifying the galley : the Frances was the best small boat galley i have ever worked in as its in the centre of the boat under the doghouse and can use the chart table as a work surface….even that galley got modified with a new hob and storage bins underneath. In that galley i could stand and cook in the best space in the boat and still have nearly all-round visibility, above must have been towards the end of the refit when i was living aboard as i can see that the icebox just beyond the chart table is finished. Right now i am thinking about the summer cruising aboard the Liberty and know that i really need to improvise an icebox for the boat…..must go and get the materials this weekend !. Aboard the Liberty i use a plastic stacking crate as a ready-food larder and that sits in the modified heads compartment, longer term and heavier food is stored under the berth infill which is set up permanently. There is space in the heads compartment for either a second crate or a similar sized icebox which will become more useful as the sea warms up….at the moment stuff like milk stays cold as the containers stand on the sole so they stay at around ambient water temperature. I like to cook as well as i can on the boat : i try to have as much fresh food as i can which is why i am heading towards needing cold storage again but like most sailors i can also rustle up a hot meal from the tins larder and dried goods that i keep aboard. Long gone are the days of living on freeze-dried chemical gloop !. This years experiment and the title of the blog is improvising a dutch oven so that i can bake or roast on the hob using a cast iron casserole as the dutch oven. Results so far have been a bit mixed, if anything i have tended to over-cook a bit as i have been keeping the iron casserole a bit too hot. The way i use it is similar to the bushcraft technique where i put some stones in the bottom of the oven and then stand a dish in that to cook in…by chance it will also just take a standard large pie in a foil dish so that’s an easy meal early on in any trip. I have a longer period on the boat coming up and one thing i have been meaning to do is to try and bake bread in the oven, thats a harder test of getting the baking temperature right and one of the harder things to do on a boat but one of the greater simple pleasures on a voyage is to have freshly baked bread for breakfast. On long distance ocean cruising we always tried to get the dawn watch to bake a batch of bread, it wasn’t popular crew work at first until they started to realise how good it is to have daily fresh bread and its an amazingly good wake-up for the oncoming watch to have the smell of fresh bread wafting through the boat. We went from a crew not wanting to bake to becoming uber-competitive and turning out everything from sweet flavoured breads to savoury and italian-esque foccacia. For the benefit of my non-sailing friends and colleagues here the important thing to realise is that a small boat can be at sea for a relatively long time on an ocean passage : not unusual to be 3 weeks in say crossing from the Canaries over the Caribbean and similar back to the Azores or the Uk and its not only essential to have enough food on board for that time but to have food that is enjoyable as cooking and eating becomes a major feature of the trip. Very few non-sailors would think to buy and stock at home to cater for a dozen people or more for 3 weeks but that was a regular feature of my working sailing days. My regular job was to work with the cook to collect and stow all of that : i remember one voyage where we did our main shop at a supermarket where we went through the checkout with at least 8 full trolleys !….that supermarket was used to that sort of thing so the manager openned an aisle for us and the bill i seem to remember being about £4000….stocking for my little boat for 1 or 2 people and 8 days is a bit easy by comparison. Previous The long and short alternative.